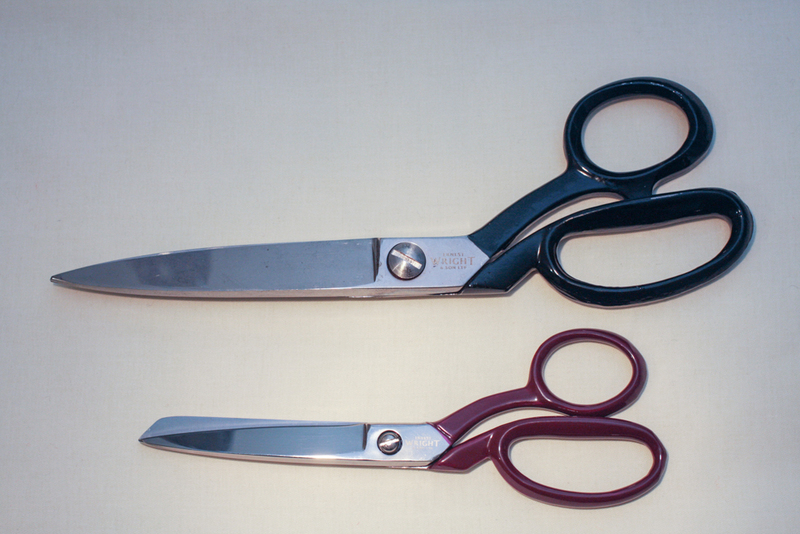 So over the last 40 years of sewing I have used a lot of scissors: From the cheap ones to the more expensive ones. 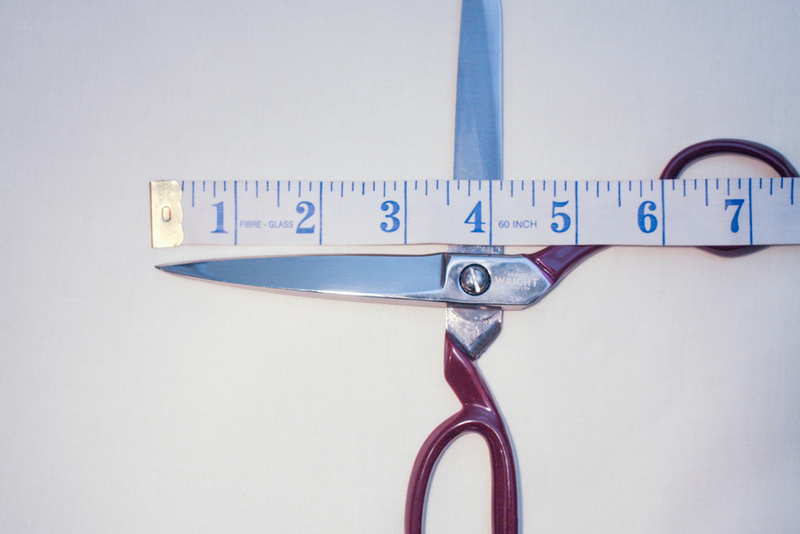 Many have become ‘less than scissors’ and many have broken or got lost. Well I want to share a secret! I have found the scissors every dressmaker/tailor/seamstress or home sewist needs: Everyone thinks if you sew you must have a good sewing machine, well actually you need a good pair of scissors first! Now before I start, I am not in any way affiliated to the manufacturer and my review will be completely based on my own views and experience. 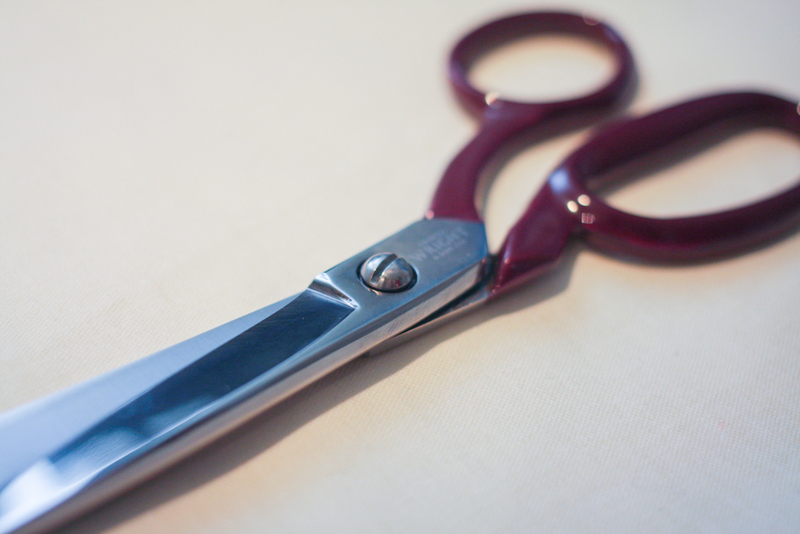 Last Christmas my (lovely) mother-in-law gifted me a pair of scissors for my sewing; thank you Hazel. They were 10 inches long and pretty hefty and made by Ernest Wright and Son of Sheffield. Now they have been used nearly every day since (I really mean every day!) and are absolutely fantastic! 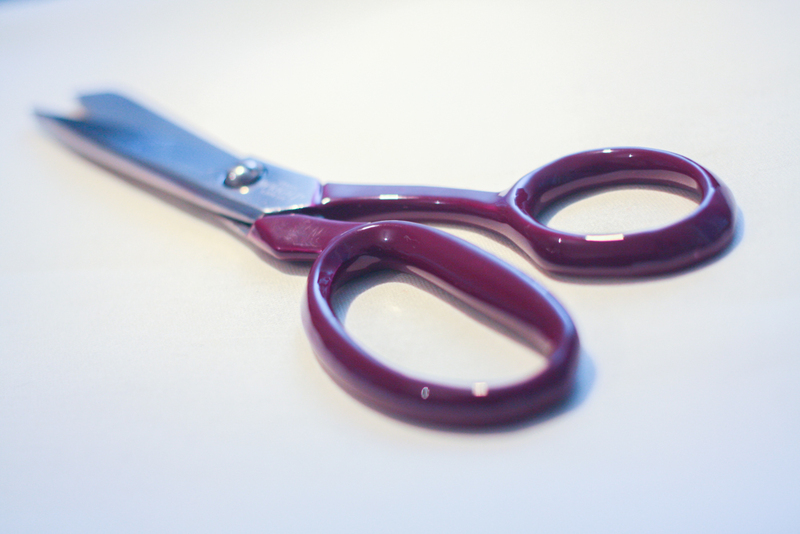 Fast-forward to this November: I saw a post on Twitter from Ernest Wright and Son @ernestwrightltd talking about their new range of 8″ dressmakers scissors with coloured handles. Well, me being as cheeky as I am, I offered to test them and write a review. I couldn’t believe it when Nick Wright replied saying “Yes you’re on!” Today they arrived. Beautiful Maroon coloured handles and ready to go! owned company and have been making scissors since 1902 in Sheffield UK (the birthplace of stainless steel). They produce scissors for home, garden, craft, kitchen, industrial and leisure to list a few applications and of course their dressmaking/tailoring scissors are what I am interested in. These are the 8″ version of their range for dressmakers/tailors, now coming in a variety of colours. Packaged in a vinyl wallet and accompanied by a seal of approval from the Lord Mayor of Sheffield, I couldn’t wait to start snipping. Out of the packet, these scissors are beautiful! they have a good weight and you can clearly see they have been made by hand. Now I don’t mean ‘made by hand’ as roughly made or put together: No I mean made by craftsmen and made with love and care. They are not made from a piece of Stainless steel that has been cut out then sharpened but they are forged, shaped, polished, sharpened and everything else that goes into making quality scissors. Now talking about weight; these weigh in at 180g and in comparison my (expensive, branded, plastic handled dressmaking scissors) are 130g, so not much difference. OK the 10″ version tips the scales at a hefty 450g but there is a lot more material making them up! They don’t have ergonomic or padded handles as they are forged with the blades. Actually, why do we need padded ‘soft-grip’ handles? If your scissors cut well then you don’t need it surely?! I know I am a man who sews but the handles are great for all size hands. My wife tried them and said how comfortable they are; her hands are a lot smaller than mine! So on to the business and how well they perform. Do they cut well? Of course they do! 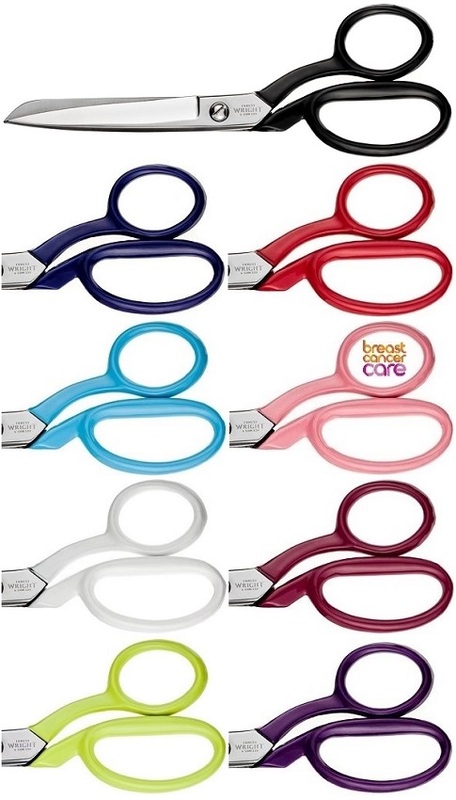 They are certainly the best scissors I have ever used. I tried about 20 different fabrics from lace, silk, satin – through cotton and wool. Every time the scissors cut through with ease. My final test was on some Wool Barathea (thin but very tough) and again they cut with ease. The 8 inch size is great and allows you to cut intricate and tight curves with ease but can also handle long straight cuts accurately. 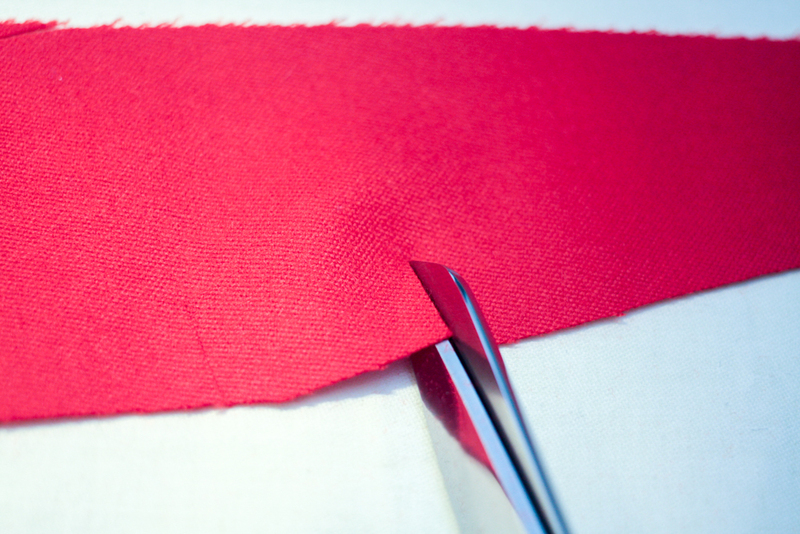 The blades push the excess fabric away gently but accurately without shifting the fabric you are cutting. 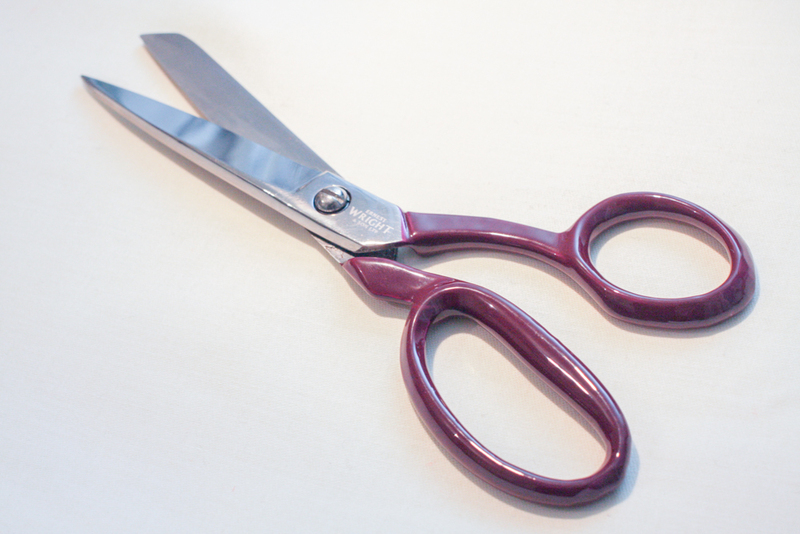 I have had so many scissors that push the fabric away as you cut but these do not! They cut right to the very tip of the blade (and I mean right to the tip!) which is great for clipping seams right up to the stitching. The top blade is curved and allows you to undercut fabric without catching fabric above. 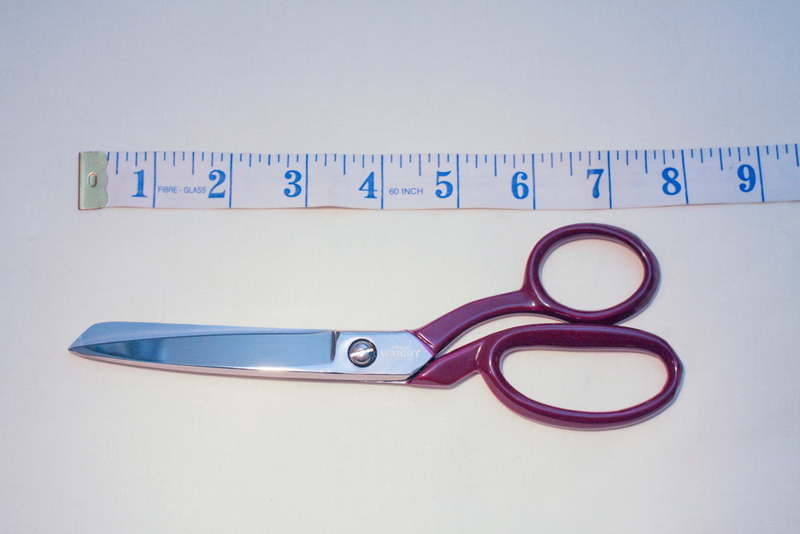 The scissors are 8 inch in length overall with the blade having a 3.5 inch cutting length and are completely smooth from back to tip: Actually so smooth you forget you are cutting something! The 8 inch version comes in a range of colours to suit you all and if you buy the pink version Ernest Wright and Son will donate money to the Breast Cancer Care charity. Here is a comparison of the 8 inch v 10 inch version. Costs are very reasonable. the 8 inch pair currently cost £40 (in your choice of colour) and when you compare them to the other branded ‘dressmakers/tailors’ scissors they are an absolute steal. What would you rather spend your money on? A pair of handmade Ernest Wright and Son scissors or some plastic handled machine made ones that cost the same or more!!?? So would I buy another pair from Ernest Wright and Son? Most definitely! They are beautiful to look at and use. 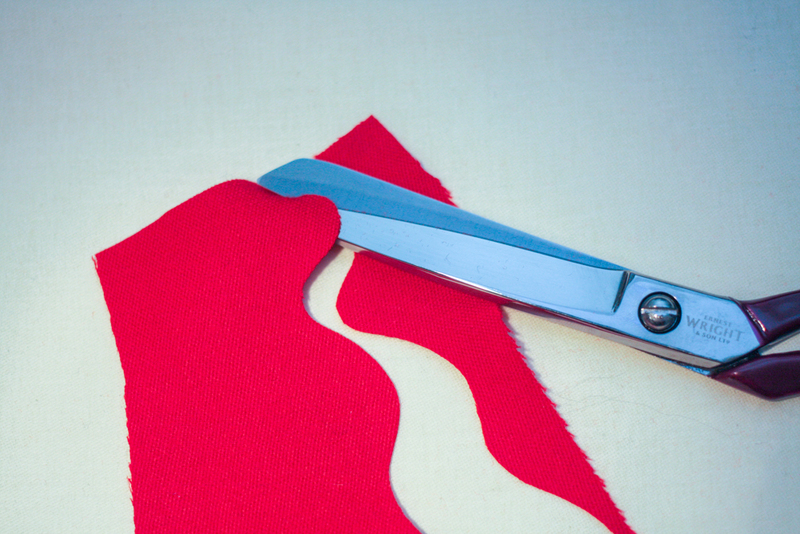 They cut, rather than chomp fabric. 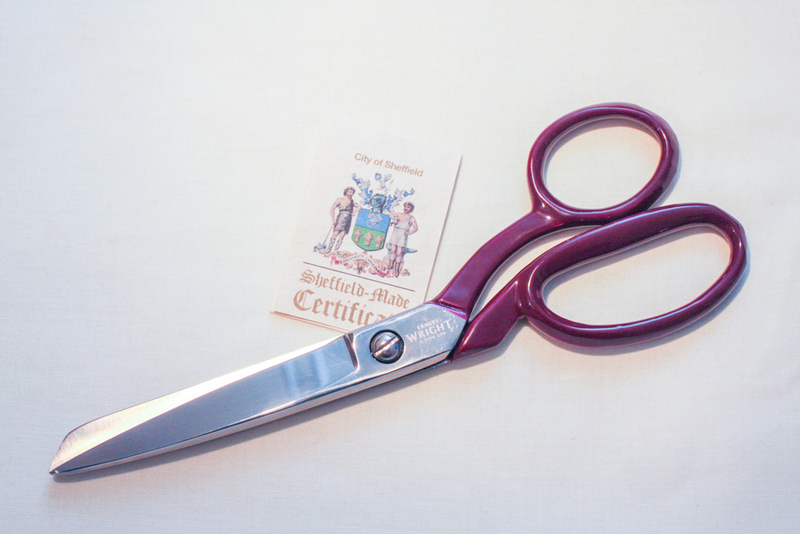 Sadly these scissors will probably outlive me but I do have my eye on their 13 inch large shears: Perhaps if I ask Nick nicely…..? Or I better sweet-talk the mother-in-law again! Since I saw the documentary on youtube, I want this scissors, too!! !